Happy 2014! Do you know that January is "National Thank You Month" on many US calendars? How about adding "Give Thanks!" everyday this year so that you can appreciate what you have? "Oh, give thanks to the Lord, for He is good! For His mercy endures forever. Oh, give thanks to the God of heaven! For His mercy endures forever" (Psalm 136:1 & 26). James and I are very grateful that our son's family stayed with us through the Christmas and New Year holidays. We enjoyed family reunions and celebrations at different homes, like having Christmas Eve dinner with 28 people in San Francisco. Our grown son and his cousins are all reminders of how fast children grow! This might be the first holiday season that I let go of all my agendas. I found myself just relaxing, eating, laughing, visiting friends, going to the park, hiking, visiting farms, reading stories, singing songs, watching videos, and playing games. 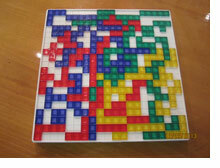 What I would never forget is the night when six of us played Blokus after dinner. Since the game was designed for four people, the little children had to team up with two adults. With YeYe (that's James) cheering him on, our almost three-year-old grandson had to climb up the table to place his piece! Another morning, I overheard a conversation and took immediate action. "Mommy, will you play with me?" "Not now. I need to spend time with your brother." Seizing the opportunity, I asked my five-year-old granddaughter, "Do you need attention too?" "How about NaiNai plays with you?" Nodding with a big smile, she said, "Come!" and off we went to play with her doll house for almost two hours! Full attention is a gift. I can still remember those days when I was feeling so stressed as a working mother and wishing things could be different. How about you? Is there anything you wish to change this year? 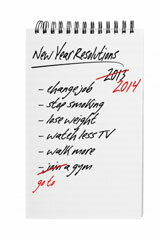 If so, I hope you will find help from this feature article, Make New Year's Resolutions You Can Keep. May the Lord bless you and keep you! When I was young, I wished I had more time for myself to sing, to read, to write, to exercise, and to enjoy time with family and friends instead of being stressed out. But life styles and habits are so hard to change. Like two out of every five Americans, Betty begins every new year with stout resolve and good intentions. But like most who make New Year's Resolutions, by the time the spring fashions hit the shop windows, all that resolve has gone the way of last year's colors. No exercise program. No weight loss and, sadly, no novel. Not even a beginning chapter. Betty's problem and the difficulty most people face in keeping their resolutions is that changing behavior involves more than simply vowing to do so. A lot more. So, whether you want to do more or less of something, quit something altogether or start something new, here are a few tips that can help. 1. Be sure the change you vow to make is something you really want, not just something you think you should do. Altering habits is hard work; if you're not going after something you really want, you set yourself up for failure. What truly matters in your life? 2. Be specific. Instead of vowing to "lose weight," state that you want to lose five pounds by March 15. State your goal in incremental, measurable, specific terms. Be certain it's attainable, too. To go from a sitting position to running a marathon in six weeks may be too long a distance to travel in that short a time. 3. Accentuate the positive. When you just say no, you're reminding yourself of what you can't have or can't do. Instead of saying "no fatty foods," say "nonfat milk and fruit for dessert." 4. Believe in yourself. Positive self-talk, affirmations and encouragement really do help. Even if you fail the first time, that doesn't mean you're doomed to failure. Be easy on yourself if you lapse. Change is often a two-steps-forward, one-step-back process. 5. Easy does it. Set your goals in short, manageable steps rather than one giant leap. Start slowly: go to the gym twice a week instead of four times; walk a block instead of a mile. As for Betty and her novel, at last report, she planned to commit to a page a day, three days a week. At that rate, by the end of the year, she'll be well on her way to a first draft. If Betty can do it, maybe you can too. What change do you truly long to make in your life this year? Don't forget it is hard to change without appropriate and proper support. Find a friend, mentor, or coach who can help you move forward. Give thanks to the God of Heaven and Earth. Remember God loves you and wants the best for you. His grace and mercy endure forever.